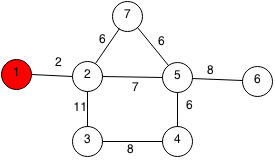 Prim's algorithm is a greedy algorithm that finds the minimum spanning tree in a graph. If implemented efficiently using a priority queue, the runtime is O(n log n). Find the closest node to that node. Find the closest node to the 2 nodes. Find the closest node to the 3 nodes. Find the closest node to n-1 nodes. The closest node is the node with the lowest cost edge to the already connected nodes. 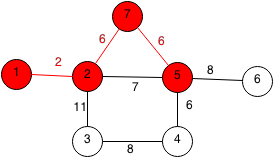 Suppose we have the following graph and we would like the find the minimum spanning tree. We can start at any random node so this example, we will start at 1. 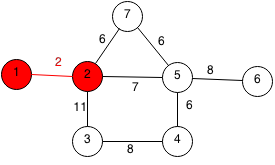 The closest unpicked node to all the chosen nodes is 2 at a cost of 2. 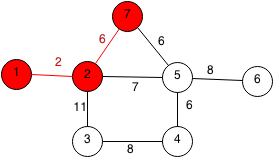 The closest unpicked node to all the chosen nodes is 7 at a cost of 6. The closest unpicked node to all the chosen nodes is 5 at a cost of 6. The closest unpicked node to all the chosen nodes is 4 at a cost of 6. 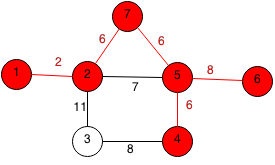 The closest unpicked node to all the chosen nodes is 6 at a cost of 8. The last node to be chosen is 3 with a cost of 8. 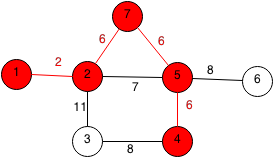 We can implement Prim's algorithm in Java efficiently with a priority queue of edges using the weight as the comparing property. // Current cost of MST. // Keep track if each node is visited. // Number of nodes visited. // Mark starting node as visited. // Add all edges of starting node. // Keep going until all nodes visited. // Get the edge with the smallest weight. // Skip if node already used. // Add all the edges of the new node to the priority queue. // Graph not connected if number of nodes used is less than total nodes. Prove that Prim's algorithm works. Extends Prim's to output all the edges used.